There's a thousand different ways to become a leader but there's only a few ways to become a great leader. If you ask any leader of a team, organization or company, he or she will tell you how to be a great leader requires a mix of nature and nurture. You have to start off with some basic leadership skills and through your experience, you sharpen those talents. Just because you're a leader doesn't mean you're a great one (we witnessed a shocking implosion of a CEO at a major drugmaker just this past week). Some leaders rise quickly and fall just as fast. Others keep the ship running but don't inspire much in their troops. Sadly, a good many lead by terrorizing their employees. A great leader, though, will do one thing that the others don't: he or she will make the people around and below better. Why is this the hallmark of a great leader? Let's use the four-quadrant concept of leadership (see diagram here thanks to the Center for Organizational Design). On the vertical axis from low to high is "assertiveness"- a key trait in leaders. On the horizontal axis from low to high is the opposing trait, "empathy." From this chart, you can figure out exactly where you stand between getting things done (assertiveness) and being a team player (empathy). Leaders who fall into the top left quadrant are dominant leaders - they're highly assertive and lack empathy. Leaders like this motivate by their sheer force of brutish personality, the "either you do this or get out"-style. Some companies, particularly those on the verge of collapse, need this kind of leader because they get results, though the results tend to be short term. Leaders who fall into the lower left quadrant are really not leaders at all-they lack assertiveness and empathy. Usually, you'll find people like that have risen to a job they didn't deserve and once in that position, they become exposed very quickly. These people tend to last a very short time in their post. 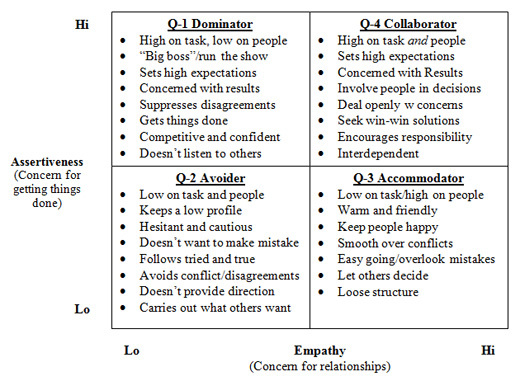 Leaders in the lower right quadrant are high on empathy but low on assertiveness. These leaders are beloved by their staff but you might mistake their company as a little sleepy. Perhaps the company has been successful for a long while and nobody has needed to rock the boat. It's a fine place to be but eventually, the market and competitors get ahead and before you know it, an abrupt change takes place. The "sweet spot" is in the upper right quadrant where you'll find a leader that's both assertive and empathetic. This is the secret sauce to great leadership. That person is not only marching up the mountain but has hundreds of people behind him or her. Why? Because they can juggle what others can't-being both aggressive and collaborative at the same time. They make the people around them better by being genuinely concerned about their growth. While they're aggressive about getting things done, they involve people in those goals and delegate well. If you want further proof, just think about people in history who are revered as great leaders. Abraham Lincoln (assertive, empathetic), Winston Churchill (assertive, empathetic), Martin Luther King, Jr (assertive, empathetic). If you're even managing one person or a team or a company, this is your goalpost.